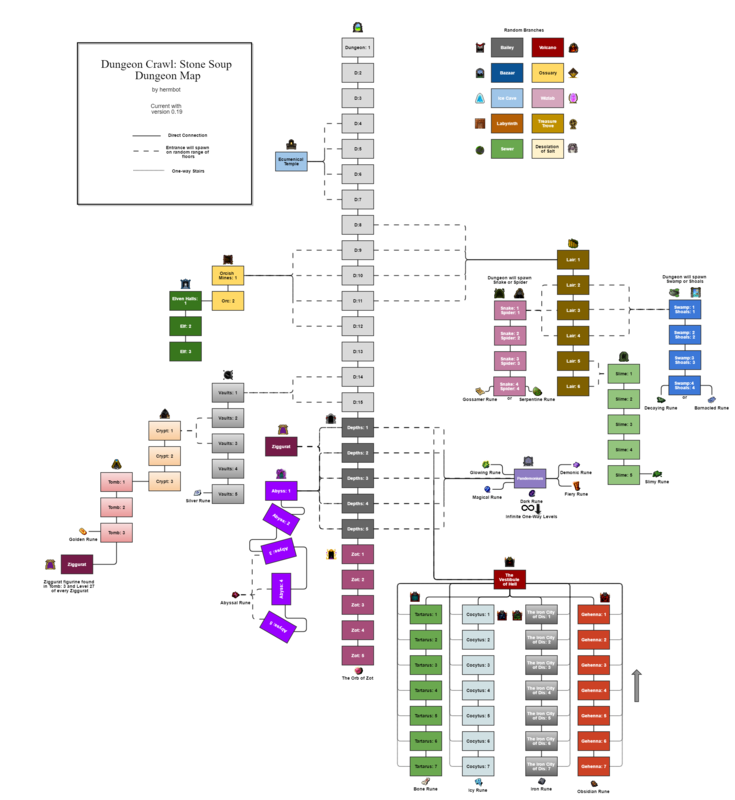 The page provides a map of the various dungeon branches and how they interconnect. For tips and tricks on surviving the individual branches, see the walkthrough and the branches' pages. You can bring up an in-game overview of the Dungeon and its various branches and portals by pressing Ctrl-O. New characters start on level one of the Dungeon, except for Abyssal Knights, who begin in the Abyss. There are a total of at least 100 levels in the game (plus two infinite realms). In addition to the standard dungeon branches, all dungeons will contain a randomly selected variety of vaults with a specific design and theme, and portals to fantastic extra-dimensional realms. Optional portals to fantastic extra-dimensional realms can be randomly found throughout the Dungeon and its branches. While none of these contain runes, they nearly always contain above-average loot and useful experience. If you know how to handle each one's theme, they can often be cleared without excessive risk. All such portals are single-entry only, and after you exit their realm, they will be gone along with anything you left inside. Unless otherwise noted, all these portals are temporary, and will disappear if not entered within a certain length of time. There are actually two clocks running: a shorter countdown while you're on the level with the portal, and a longer one when you've gone to another level. If you stay on the level, you may receive increasingly-urgent messages as the timer runs out, and the portal's appearance (check with 'x', then 'v') may indicate how much of the timer has expired. When a portal on your current level expires, you will get a message to the effect of, "The walls and floor of the dungeon suddenly vibrate!" Portals will not start closing until you reach the floor that they are on, so there's no need to rush through early floors in order to access them. Bazaar - Shopping spree! Portals to bazaars are usually temporary but may rarely be permanent. Permanent ones will not be announced. Ice Cave - Freezing clouds, wild animals, and occasionally icy demons. Gauntlet - A choice between several arenas. Taking the challenge will get you some loot, but also pits you against a deadly minotaur. Ossuary - A small tomb filled with mummies and their undead guardians. The Sewers - Fetid waterways teeming with rats, snakes, and occasionally nastier things. Treasure trove - Contains several acquirement-level items, but getting in requires a rare and valuable item in return. Is always permanent. Volcano - Fire and lava everywhere. Also lava-dwelling creatures. Wizard Laboratory - The abandoned laboratory of one of several famous mages. Ziggurat - The ultimate challenge: 27 floors of increasingly difficult battles, but with riches untold for those who win through. Ziggurat portals are permanent, but only one spawns naturally in the Depths. They are also created from evoking a figurine of a ziggurat, which can be found on Tomb:3 and on level 27 of a previous ziggurat. 0.23 replaced Labyrinths with the Gauntlet. The Desolation of Salt was added in 0.19, and the Lair was shortened to 6 levels and the Slime Pits to 5 levels. Prior to 0.19, ziggurat portals spawned randomly in Pandemonium. The lair branches were shortened from 5 to 4 levels in 0.17. The Hall of Blades was reduced to a subvault in Elf:2 in 0.15. The Enchanted Forest was considered for inclusion in 0.14, but was eventually rejected after several months of play-testing in trunk. This branch would have occasionally replaced the Crypt. The Spider's Nest was made a full-fledged branch in 0.11. This page was last edited on 24 February 2019, at 06:31.